It is also called La Estrella Solitaria or the Lone Star. 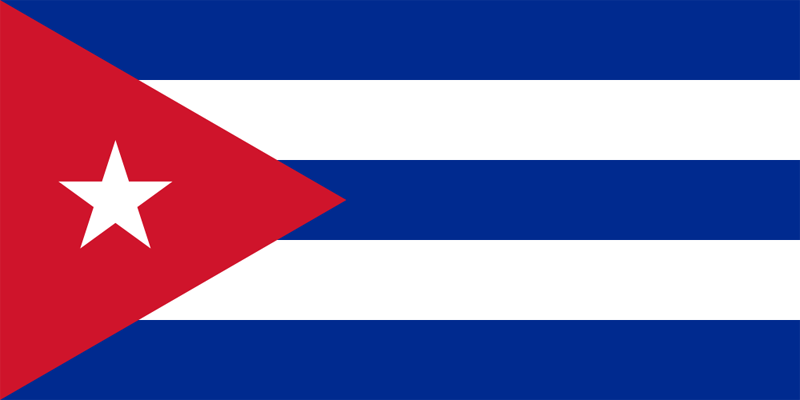 The flag of Cuba comprises of three blue and two white equally sized stripes, a red equilateral triangle on the left side of it, and in the center of the triangle is a white lone star. It was officially adopted on May 20, 1902. There are two interesting stories that relate the origins of the flag of Cuba. The first story recounts that Narciso Lopez, the Venezuelan general who helped Cuba gained its independence, had been carrying the flag during special meetings in order to convey to the people the symbols that is being depicted by the flag. The three blue stripes are for the Cuba’s three provinces, the triangle for its Masonic symbolism of brotherhood and equality, and the red color is for the heroism shown by the patriots in spilling their blood. It was unfortunate that Lopez didn’t live to see his dream of independence. He died in 1851, while Cuba only hoisted the flag as a symbol of their independence on 1902. The second story literally came in a dream. Narciso Lopez was asleep in one of the New York Parks when dreamt that the revolution he was a part of needed a flag that will strengthen their mission and their message. Upon awakening, he saw the sky and it inspired him of what the flag of Cuba should be. He related this to his friend, a poet and a future patriot, Miguel Teurbe Tolon. Tolon acted upon it and thus the Cuban flag was born. The three blue stripes for the three regions namely the Western, Central and Eastern Cuba; the white symbolizes purity and justice; the lone star for unity; and the red triangle for brotherhood, equality, fraternity and the blood spilled by the martyrs and patriots who fought for Cuba’s liberation.